Welcome to PFC James D. Price Elementary School, where your child will never be a face in the crowd. With just under 100 students, our school is small enough for teachers and other staff members to get to know each one. That makes it easy for us to care about your child's unique educational needs. Our school is located on the Yuma Proving Grounds, near the Arizona-California border, about 24 miles north of the city of Yuma. One of the largest military installations in the world, this U.S. Army base tests military equipment in the natural environment of the Sonoran Desert. We are a unique community of military and civilians working together to support the test center. As residents of the southwestern Arizona desert away from the big cities, we enjoy sparkling clean air and some of the best weather in the world. Mild winters, low humidity even in the summertime, and an average of 350 sunny days a year make the Yuma area a great place to live and go to school. We encourage you to make yourself at home on our website. Learn about us and our mission to serve your children. We have included a page to answer frequently asked questions that you may find useful. If your questions aren't answered there, feel free to contact us. Browse through our helpful links. Check out the calendar, and come back often to keep up with the news and events at your school. Your student will be glad you did. As the principal of James D. Price Elementary School, it is my pleasure to serve this outstanding community. At Price school, it is our mission to promote a secure and positive school climate that focuses on nurturing the whole child. It is our desire to cultivate a great partnership where our principal, staff, students, and parents work together to best meet our students’ academic and social needs. With a focus on technology, classroom instruction will align with the Arizona College and Career Ready Standards. The Price staff will work hard to build our students’ basic foundational skills, teach key concepts, and emphasize strong character development. 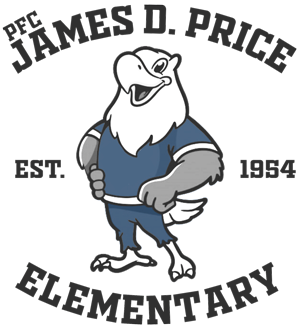 We, the staff of James D. Price Elementary School, are excited about all the great things happening on our campus. The school website is an excellent tool to keep you informed. Please check back frequently. I encourage you to get involved at Price School, where community building is important part of our mission.